Have you built your own platform? To learn how you can use your platform to generate real revenue for your business, I interview David Siteman Garland for this episode of the Social Media Marketing podcast. In this episode, I interview David Siteman Garland, who is the host of The Rise To The Top podcast. His video and audio podcasts are focused on equipping bloggers, podcasters and YouTubers to grow a sustainable business with their platforms. He also wrote the book Smarter, Faster, Cheaper: Non-Boring, Fluff-Free Strategies for Marketing and Promoting Your Business. David shares how he grew his platform and the various ways he has monetized it. You’ll learn how to get started generating revenue and the price points you need to look at. David says it’s a classic problem for most people. The platform space falls into two different categories. The first one is when it’s a hobby. Here people have great content but don’t know what to do with it. The second one is where you have the classic “Internet marketers” who have figured out how to make money but their content isn’t great. David’s advice to those who have great content but struggle to make money is you have to remember that you’re positioned extremely well. If you have great content that’s a side hobby, you can turn it into a legitimate six-figure–plus business. David started out the exact same way. What he and his friends have achieved shows that it’s very attainable. David's platform, The Rise To The Top. You’ll discover why it’s a good position to be in if you’re a blogger, podcaster or YouTuber. A lot of the time, people lack strategy on how to generate revenue. In David’s eyes, the hard part is building your audience, community and trust. Once you have all this in place, the monetization angle can be brought in pretty easily. The hardest challenge is to start with no platform and no product. If you already have the platform, then you are 50% of the way there. Listen to the show to find out how you can use technology to accomplish what traditionally businesses had to pay a lot of money for. What is the platform you have built? David started his platform The Rise To The Top in 2008, when it was a simple interview show for entrepreneurs. His show now focuses primarily on what he calls mediapreneurs, who are people with a platform. He currently has over 7 million community members. 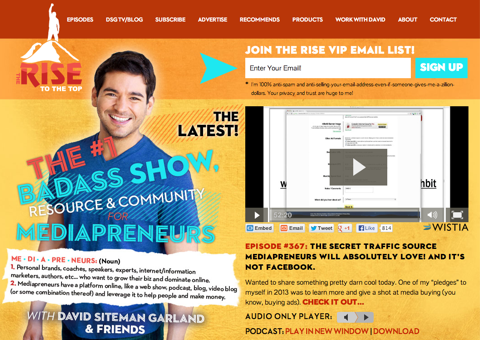 The Rise To The Top started out as an interview show for entrepreneurs. When David was on the journey of building his platform, he realized he was pretty good at creating content, building his audience and getting out there. The main struggle for him was how to turn it into a sustainable, long-term business. There are many ways to monetize a platform. It doesn’t come down to which one will be best, it’s more about which one you are really excited about and want to do. You have to feel comfortable with it. You’ll discover the many ways you can monetize your platform. From a content perspective, David publishes two brand-new shows every week on his platform. One is an interview and the other is a video for his The Rise To The Top and DSG TV YouTube channel. You’ll discover what both of these involve and the areas he focuses on and why. Listen to the show to find out how David discovered the options he went with. David states that before you monetize your platform, the first thing you need to have is an email subscriber base. 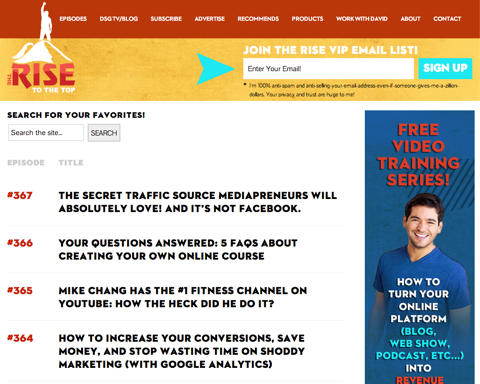 He has seen people generate six-figure revenue from hundreds of email subscribers. He has also seen people with 100,000 email subscribers struggle because they didn’t have a great strategy. Make sure you have an email subscriber base in place first. It’s important to have a brand in place, which shows your site is legitimate. When people visit your site, it shows them you are serious. This will also increase the likelihood of your success. Most people right now have something that they can monetize. You’ll find out one of the best ways to discover what you could create and package up to sell. The main way that David generates revenue with The Rise To The Top is through his online courses. The monetization opportunity was right under his nose all along. You’ll hear how the opportunity came about and what he did to generate revenue. Listen to the show to find out what the shift was for David and how it helped his business take off. David talks about how everyone is in different camps when it comes to generating revenue and everyone will tell you that theirs is the best. You have to realize that it’s whatever resonates with you. All of them work in some way. It just depends on where you want to go. Here is a list of different monetization strategies used by the top mediapreneurs. You’ll hear David give a pro and con for each category. Listen to the show to find out the best option for you, if you have some unique knowledge that people are interested in. Is it best to do an online course yourself or bring in other experts? David has seen them done successfully both ways. The advantage with an online course is that you can do a lot of work up front and get paid for it over and over again. As long as you promote well, you can get paid for it without it taking up any more of your time. These online courses sell at a premium price over any other kind of information product. When you sell something for a premium price, you’ll get premium buyers. You’ll need fewer of them to generate a huge amount of revenue. Online courses can generate a huge amount of revenue. You’ll hear the different ways you can run a live online course and how to deliver it. If you decide to bring in the experts, make sure all the sessions fit together well. David talks about how he and his customers/clients have the same goals, which is to generate freedom for themselves. You’ll find out why David loves this option the most. When David created his Create Awesome Interviews course, he prepared every single thing in advance. Everyone got access on the first day and for those who bought within the first 10 days of launch, he offered bonus Q&A sessions. It’s a great way to reward the early buyer. 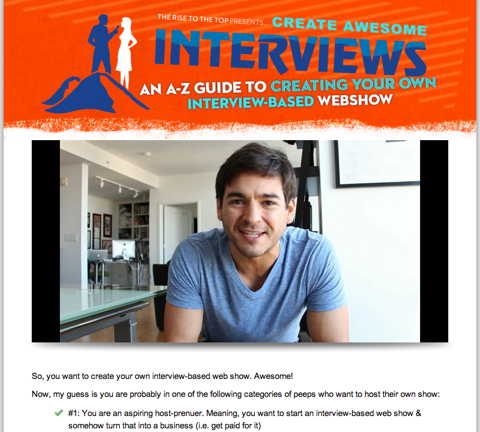 The Create Awesome Interviews online course was all prepared well in advance of the launch. Listen to the show to find out what David did with the Create Awesome Interviews course that took it from a $20K-$30K product to several $100K. David believes that there isn’t a magic number when it comes to knowing what to charge, but there is a magic philosophy. You want to be at the premium end of your market. Besides the premium buyer and the effort you will put into this course, it comes down to positioning as well. Do you want to be the cheapest on the block or do you want to be at the high end? You'll get better-quality customers when you charge a premium price. David encourages people to do what he did, which was to look at the top end of his market and his particular customer. You also need to check out other sources and determine those price points. You don’t have to work your way up to that range, you want to be in that price range. You’ll learn what price range David goes with and a few things to keep in mind if you think you’ll struggle with charging a premium price. At the end of the day, David encourages you not to sell yourself short. There is a myth out there that people will start with lower-end products before moving to something premium. This has been disproved by himself and others. The way you feel when you make a sale and know that people are getting results from your help is amazing. You start to take pride in your business and you know that you have something legitimate out there. Listen to the show to find out what advice Marie Forleo gave David, when he was struggling with choosing a price point. You’ll discover what David believes is the magic sauce and how visualization can help. Listen to the show to hear two examples that you should visualize to help you move past that mental block. I recently discovered a WordPress plugin called jQuery Pin It Button For Images. When anyone visits your website and they hover over an image, a Pin It button will appear. This allows them to Pin It to Pinterest. You can see this in action when you hover the images in this article. This plugin offers a lot of cool capabilities on the customization side. One of the more important capabilities is that you can set the minimum resolution on which the Pin It button should show up. This plugin allows for easy pinning. You’ll hear what we have it set on at Social Media Examiner and why this works best for us. Connect with David on his website. 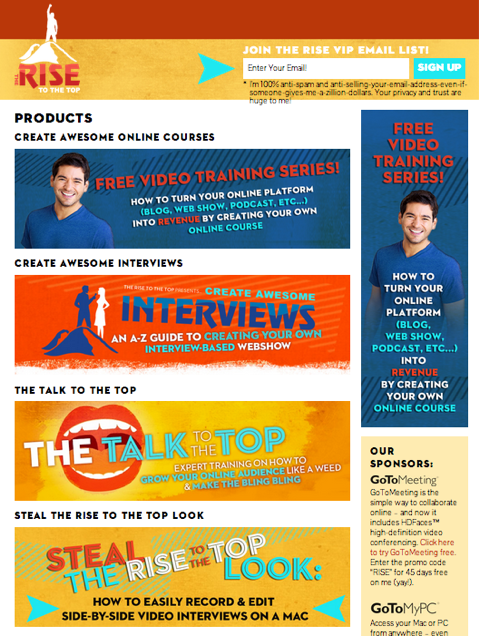 Take a look at Create Awesome Online Courses, for fun high-quality free video training to help you get started. Listen to The Rise To The Top podcast. Check out David’s book: Smarter, Faster, Cheaper: Non-Boring, Fluff-Free Strategies for Marketing and Promoting Your Business. Watch The Rise To The Top and DSG TV YouTube channel. Take a look at how we promoted our online event: Blogging Fundamentals for Business. Check out Marie Forleo, who took the customer’s perspective when pricing. Try the WordPress plugin called jQuery Pin It Button For Images for easy pinning. What do you think? What are your thoughts on monetizing your platform? Please leave your comments below.